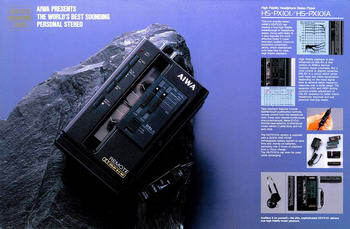 The PX101 probably represent AIWA's first try to build a real competitor to the good sounding DD machines from SONY, specially to the DD100 Boodo Khan. 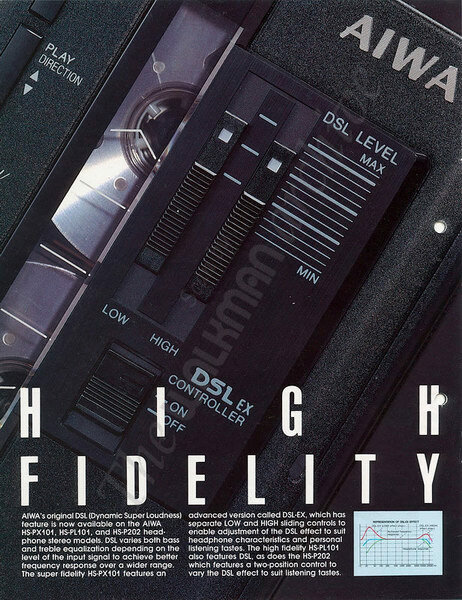 With Dolby C, parametric DLS-EX and high quality headphones, this walkman was announced as being the "world's best sounding personal stereo" at the time, back in 1987. Headphone Stereo catalogue (page 6). 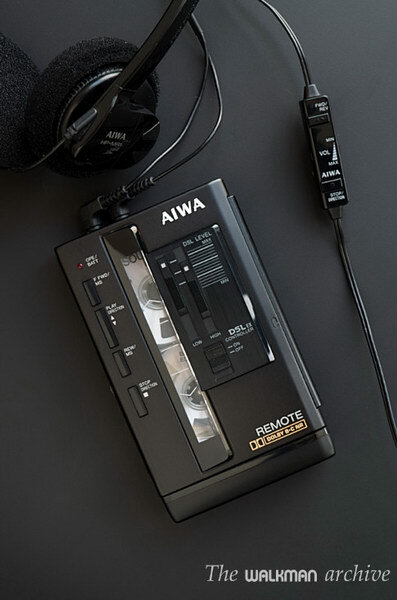 It's probably one of the best sounding stereos from AIWA (only the PX303 and the PX1000 achieves similar performance, probably) and it's design is very stylish, with feather-touch operation buttons on the door. 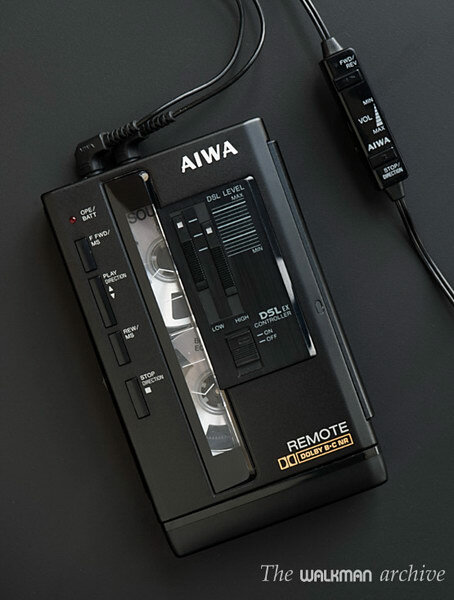 The PX101 was also one of the first AIWA to have a remote (first one was the G08, three years before), that it's connected to a second 3.5mm jack, beside the headphones jack. A few years after these two jacks become one. 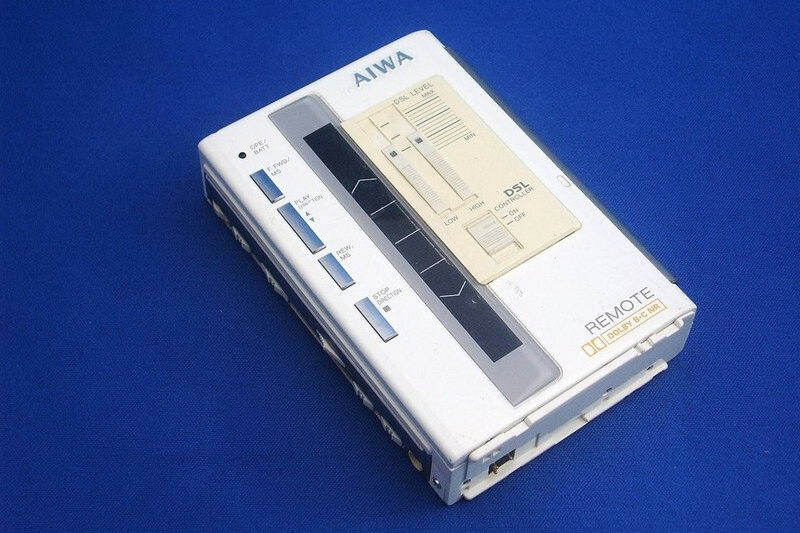 This model can be powered, like many other AIWAs, from an acid gumstick battery (which these days are all dead) or with a pair of AAA. 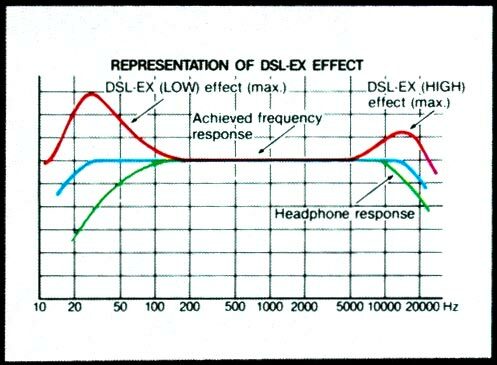 In 1987, no other brand had a true competitor to PX101; only the SONY DD100 Boodo Khan, which remained the same for three years could achieve a comparable sound quality (in fact, probably with less wow&flutter), but with worst equalization. 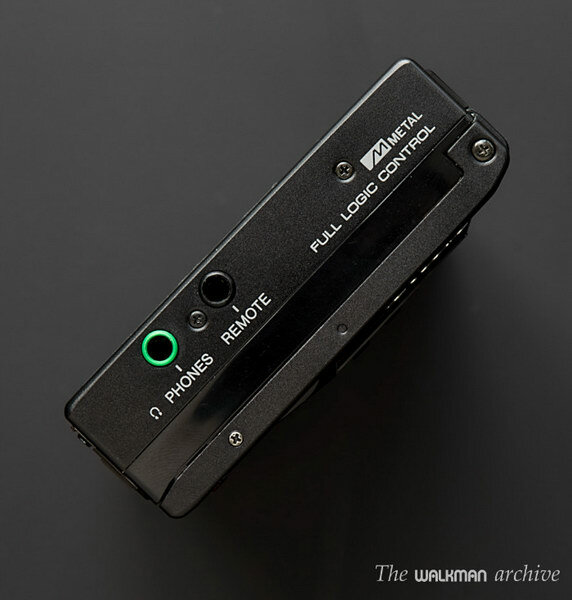 So I can say that the PX101 was the absolutely top player in the world that year, with a size only a bit bigger than the WM-101 and a sound quality and equalization options much better. 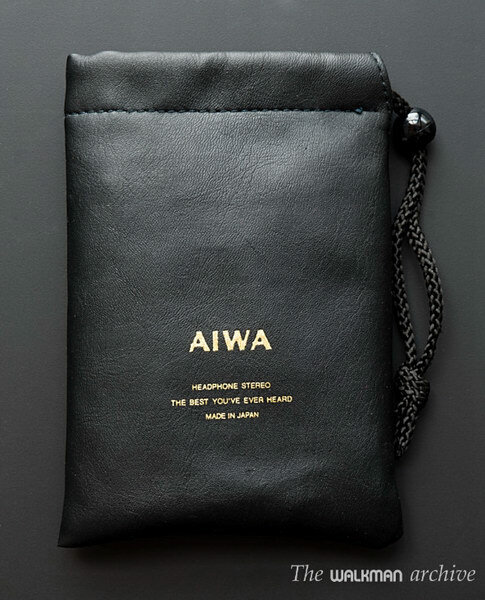 Many say that the PX101 was the best sounding player AIWA ever made. We have here one of the top players ever, so it's rate is top level too... Trebles are crisp and clean, and the whole music is powerful; the EQ is superb. 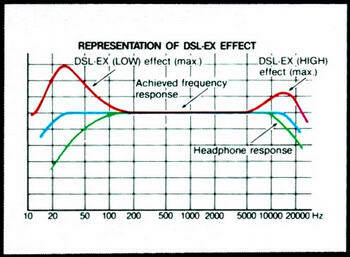 But the Dolby system, as many other walkmans, cuts the high frecuencies so much, specially when C-type is active. 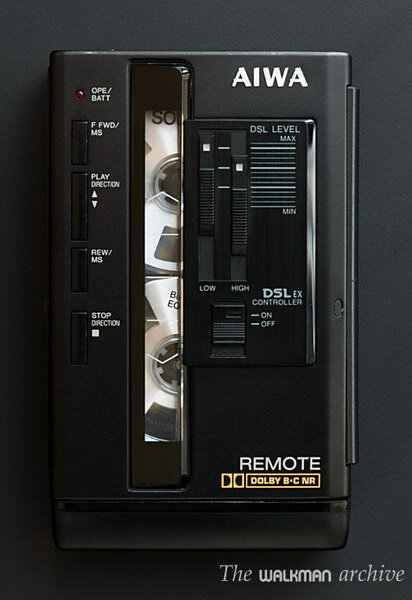 For rating the sound quality, we use a pair of high quality Sennheiser HD 280 Pro headphones, and a test tape (Maxell XL-II) with a high quality recording made with a SONY D6C professional portable deck. However, this is a personal opinion and it's not intended to be a precision rating. Before testing it, it was taken to a professional technician for examine, repair and fine adjusting. Remember these are old machines and internal belts stops working properly after some time. Of course, head and rollers have been carefully cleaned before testing. NOTE: If you have any useful info about this model, you can collaborate with us if you want to. Please send us an email and share your info. We will update the page with it. *: Without Dolby and without any ecualization or sound processing. PX101 came with a pair of good headphones, like the HP-MR1. 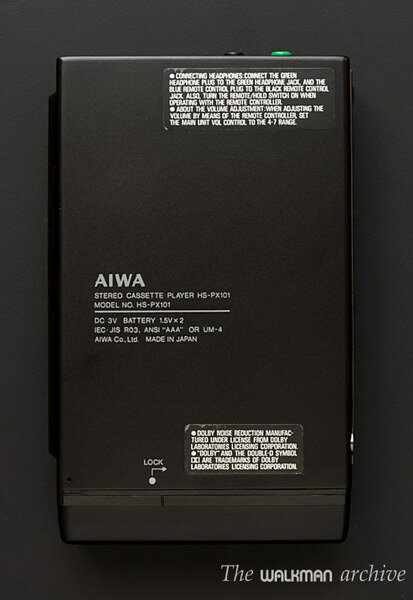 AIWA's PX101 case The head is yet standard (HX Amorphous was not released yet). 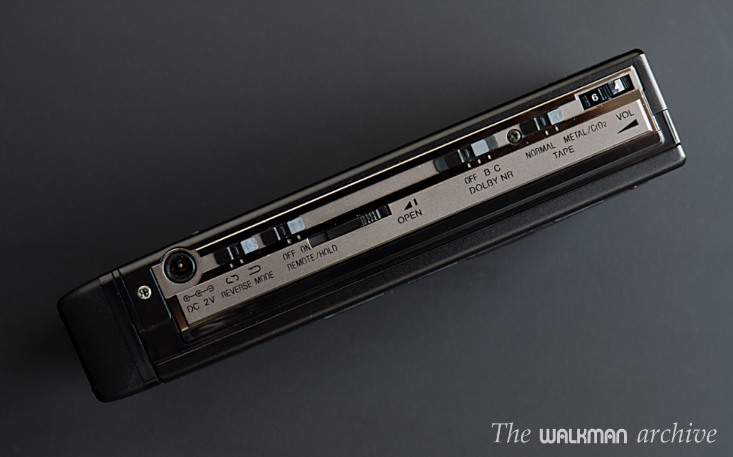 The complete PX101 line, with the addition of the PX20. To have all these models joined is one of the rarest walkman group in the world. Photo: TheLion. 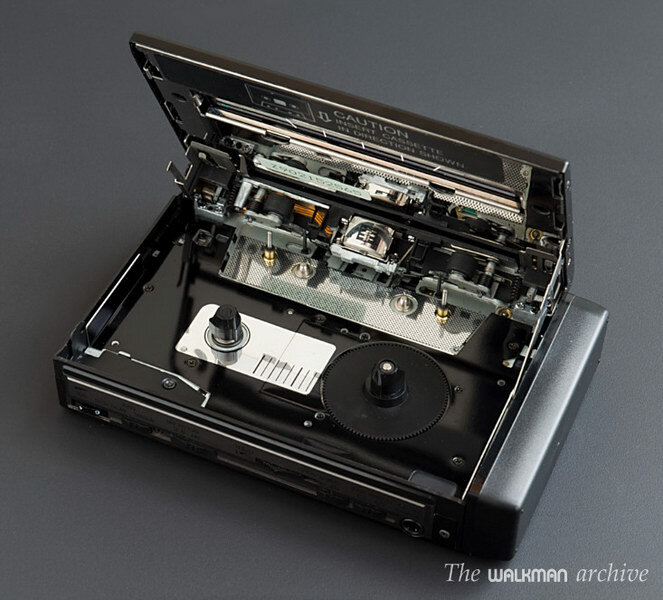 The grey PX101, an extremely rare unit. Photo: TheLion. The HS-PX101 white, extremely rare. Photo: Unknown. 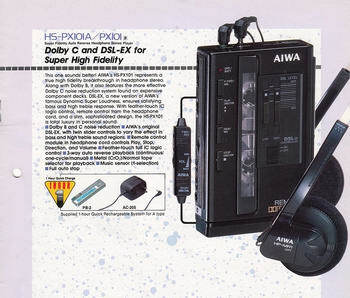 The AIWA PX-20, a special version only released in Asian markets. It's almost identical, except for the addition of a HX Amorphous head. Photo: Unknown. 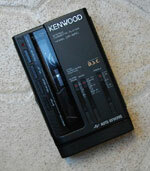 The Kenwood CP-9RC, a very rare unit, a copy of the PX101. It features the same, except DSL and Dolby. Photo: TheLion. 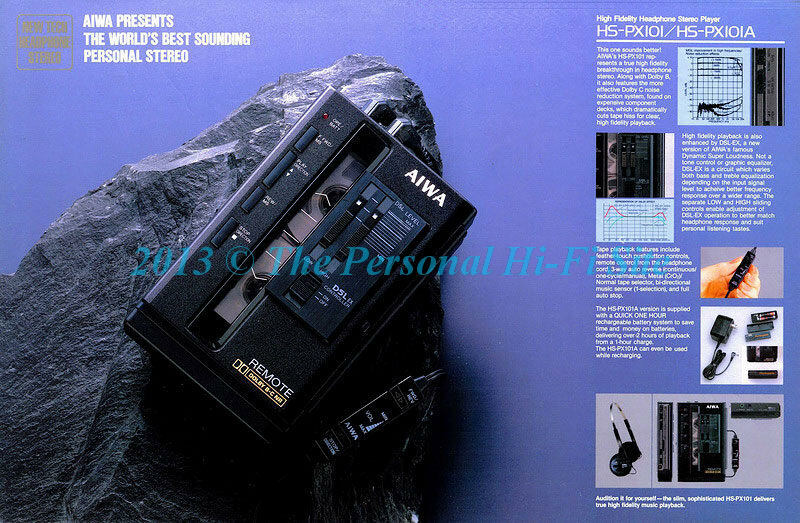 AIWA '88 Headphone Stereo catalogue (page 5). 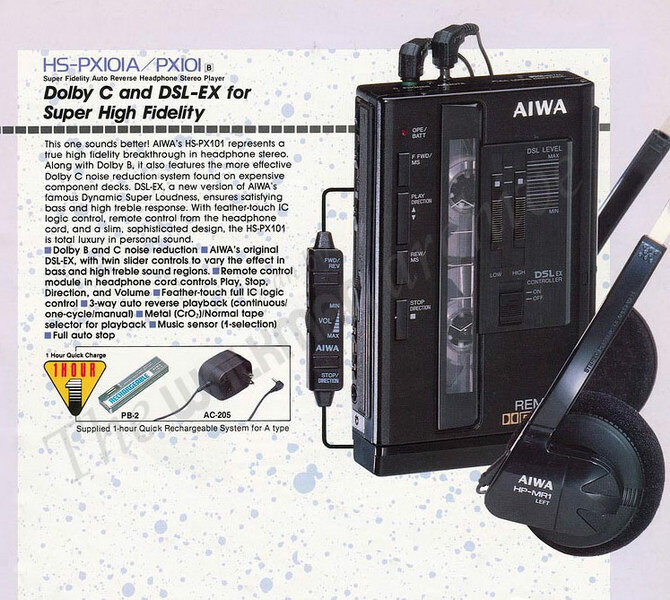 AIWA '88 Headphone Stereo catalogue (page 6). Original HS-PX101 catalogue, courtesy by TheLion. 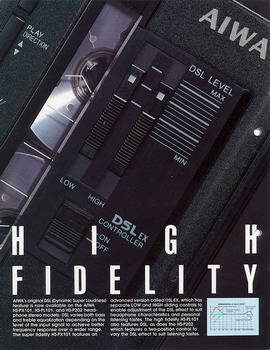 Crop of the SONY '86-'87 general catalogue released in Spanish. BBE Barcus Berry Electronics, the name of the actual BBE Sound, Inc.